These days, not many homes are without microwave ovens, as these remarkable appliances synchronize very well with the busy lifestyle of working parents. When there is very little time for food preparation after work, a microwave can be an invaluable way of quickly preparing a delicious and nutritional family dinner, or for warming up leftovers from earlier in the week. So the big question about a microwave is not whether to have one, it's where the microwave should be located in your kitchen to make best use of it. Here are some possibilities. A kitchen cart can provide you with an ideal way to save counter space, and at the same time keep your microwave portable, moving it wherever it's needed for a given application. If you use your kitchen cart as a permanent appliance platform, you can lock the casters in place so there's no unexpected movement of the cart. If you do have the available space on a counter top to accommodate a microwave, make sure it's a place that's near an electrical outlet and close to where you prepare much of your food. Be sure not to place the exhaust vent of the microwave directly opposite a wall that might obstruct its natural airflow. If you have a built-in nook where you can install your microwave, this probably is the most appealing location for it. This makes your microwave look as though it's part of an integrated kitchen design, with all appliances strategically situated for functionality and appearance. The drawback to this option is that building such a nook does require some advanced carpentry skills. 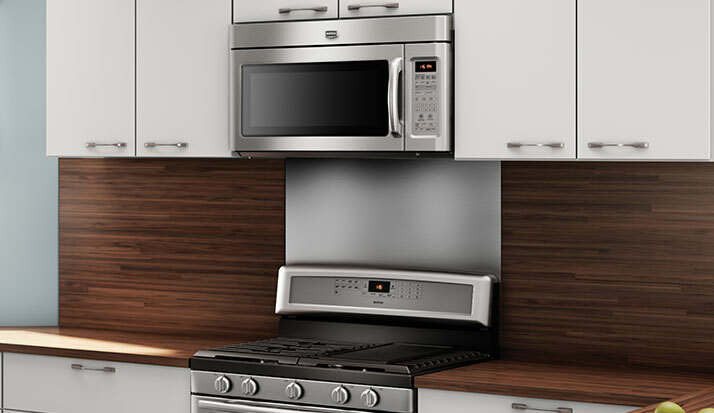 This kind of installation for a microwave also calls for some advanced skills, because you will need to vent the microwave either through the top or back of the area above your range, and you may also need a connection to the outdoors through your wall.